Until now webmasters had to use a link for Google Reader, and user was supposed to share that stuff to Buzz. To complicated for users and webmasters. First of all not everyone uses Google Reader, and second even if they do they probably don’t wish to share everything from Reader to Buzz. All of these parameters are optional. 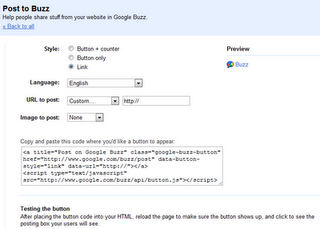 This is the link for creating Buzz button codes.